Race 2 of the 2009 Pro Truck Nationals series kicked off on Friday in Bonne Terre, MO at Big River Sand Drags. Ben Dozeman was the big winner on the night, making it back-to-back wins in 3.5 Index class action. Dozeman, from Michigan, defeated Kentucky’s Ryan Wilson in the final round. 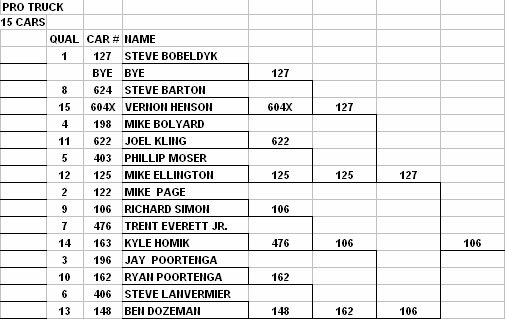 Friday’s action also saw a strong ATV Index class with Art Gordon defeating Kevin Betzer in the final round. The night’s Grudge Match was scrapped when Josh Stephens suffered major driveline damage on a test pass earlier in the day. Scott Scheytt came out anyways and ran a nice 2.874/113.64mph pass. Time trial action starts early in the afternoon on Saturday. Stay tuned to NSDN for all the latest. - Many of the Michigan racers were recording best ever ET’s during Friday’s Test and Tune. - Mike Page ran a 3.53 with his Blazer. 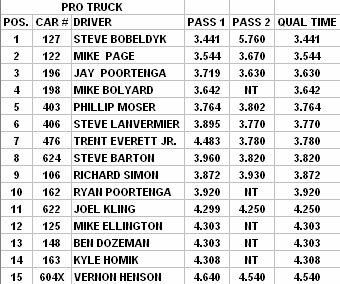 - Rich Simon ran a great 3.56 in his truck, another personal best. - Ben Dozeman laid down a 3.51 best in his Bad Company Jeep in semi-final round 3.5 Index action. - Jon Sorg debuted his new V8 dragster and ran a best of 3.36@103mph. - Trent Everett ran a personal best of 3.65 in his Jeep. - Big wheel stands happened pretty regularly; Dan Wies had a wheelie bar bending wheel stand in round two of the 3.5 Class, Jeff Richardson of Missouri had two wild wheel stands on a test and tune pass, and Ryan Wilson had the front end way up there on his final round 3.5 pass against Ben Dozeman. - The Missouri contingent laid down some impressive times on Friday; Eric Gallay's Jeep with Jamie Hutchins driving ran a best of 3.52 with his Blown Jeep while Jeff Richardson ran a 3.58 best with his white Altered.